In my annual visit to Edinburgh one of my favourite outings is taking my grandson to the John Knox, Story telling Centre. To the children’s storytelling sessions that often include music and making things. Ideas shape the way we see the world and our place in it. So I love the way story-telling is a recognised art form in Scotland. 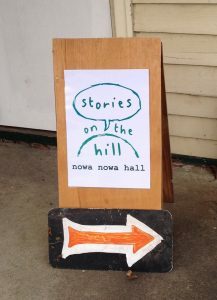 The Stories on the hill @ nowa nowa hall this year had a theme of hidden histories being shared. Writers spoke of the challenging yet liberating experience of crafting stories often inspired by extracts in letters, diaries, shared yarns or memories kept silently in hearts and minds then slowly given a context through research. People came from Melbourne and across Gippsland to listen and be part of conversations with Wayne Thorpe, Eileen Harrison, Carolyn Landon and Bruce Pascoe. Writers who spoke of the impact of publishing their stories and the way it enabled lives and lifestyles which had been invisible to be visible. 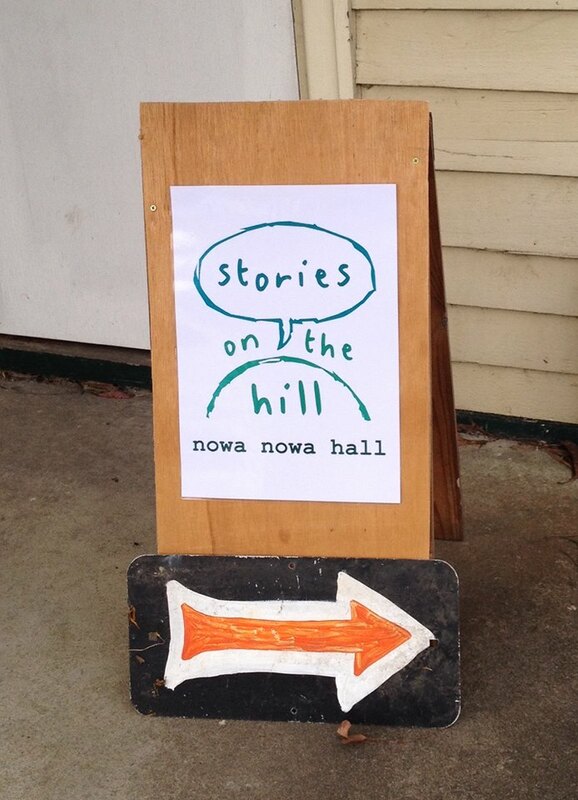 For the first time held over two days the interest was impressive and a great introduction to Nowa Nowa. Each story offered readers points of connection. Wayne Thorpe’s Bung Yarnda (aka Lake Tyers) (2016) story links an ancient protection story with contemporary environmental understanding of the importance of bio-diversity. It has universal relevance to estuary management and is a topic close to the heart residents, artists and visitors involved with the Regional Arts Victoria, FLOAT project (www.float3909.com). Photographers tracking the seasonal changes of plants, animals and water flow in Lake Tyers were keen to share photos with Wayne as were East Gippsland Bird Observers. All present were invited to share the responsibilities of being custodians of the lake. Long term resident and about to be published author Jack Whadcoat welcomed this invitation, pointing out that activity in the catchment impacted downstream. Taking care of activity in the catchment was essential to the health of life on and around the lake. We look forward to his history of Lake Tyers next year. 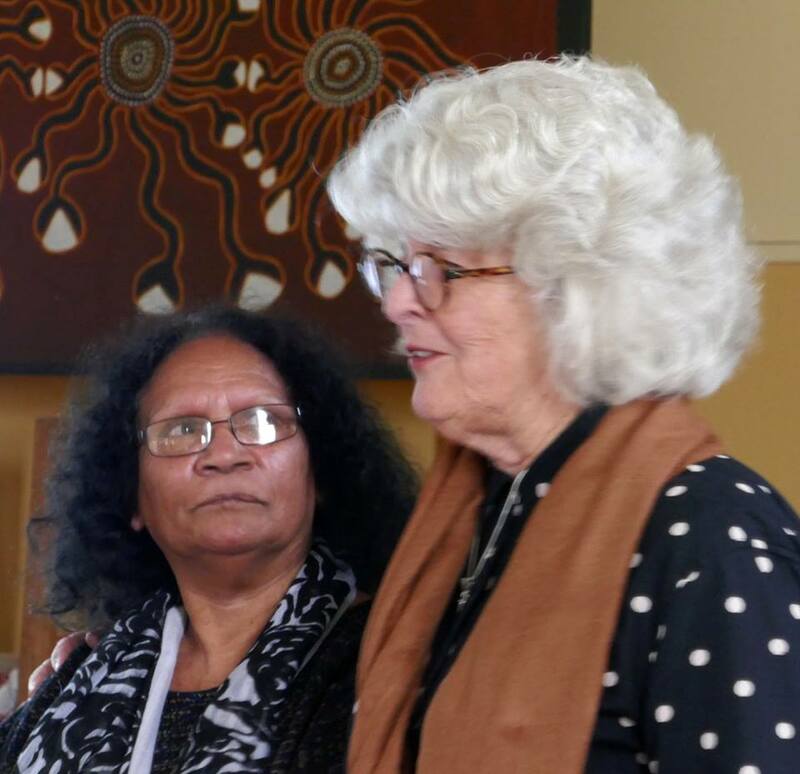 The weekend proved timely in gaining insight into the personal and public impact of Black Swan: a Koorie woman’s life jointly written by Eileen Harrison and Carolyn Landon in 2011. The decision to relocate the Harrison family away from family and friends at Lake Tyers to Ararat resulted in tragic circumstances for Eileen, her siblings and parents. Eileen tells how in the process of writing Black Swan she came to understand the link between the assimilation policies and the damage to her parents. She speaks with a quiet but strong voice in forgiving them for what happened to her once loving family. Born deaf a focus of her powerful presentation is through her art. The linking motif is the black swan breaking free – the story she came to Carolyn Landon to help her initially write as a children’s story. This weekend Eileen proudly showed images of her prolific paintings available to us due to a recent exhibition at East Gippsland Art Gallery. Eileen is now Dr. Auntie Eileen having been awarded an Honorary Doctorate by Federation University for her artistic contribution. A bonus of the weekend was the sale of her paintings to enthusiastic buyers who engaged with her story and art. An inspirational story with a new chapter. Carolyn was delighted to learn of life for Eileen since Black Swan was published. She spoke of her own introduction to lives very different to her own in Chicago when she became involved in a literacy program for black students. A completely new world for her. She is a skilled listener and collaborator in crafting stories invisible to mainstream life. 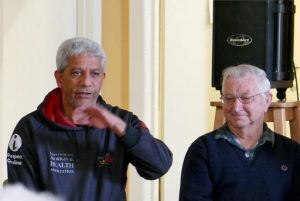 All have Gippsland connections and include: Jackson’s Track with Daryl Tonkin (1999), Jackson’s Track revisited (2006) Cup with no handles: Memoir of a grassroots activist (2009) Bette Boyanton who contributed much to the Neighbourhood House movement in Gippsland. Carolyn made the point that while to many of us these were unique stories, to those experiencing the damage and discrimination no matter how well intended, the stories where all too familiar. A more recent book, Banksia Lady, Celia Rosser, botanical artist (2015) is a beautiful book and includes pictures of the original drawings that sit alongside those of Joseph Banks in the State Library. This story too has local origins with Celia’s love of banksia’s beginning on the Marlo Plains. In the evening skilled story teller Jan Wositzky, entertained us with Bilarni (B. W. Harney) elegantly told with minimal props, it took us on a journey into the confusing heart of our own nation. 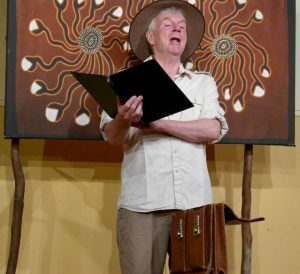 At times Jan plays himself as he held a Bushwhackers poster from a show in Halls Creek, Western Australia, inviting people to listen to ‘Australia’s Rockin’ Bush Band – The Real Sound of Australia’. Played to an unimpressed audience of 400 local Aboriginal people, Jan is later invited to attend a local event to listen to real Australian music. It was the Ngadiji dance, the story of spirit women, a dance that men and women can sing for but women only dance, describing the travels of the Ngadiji women over vast areas of land in time he left the Bushwhackers and began to research, write and perform stories that involve the audience and invite reflection. Later in the week Jan introduced Nowa Nowa Primary School students to his simple musical instruments and puppets to create their own characters and stories. Kath Sullivan from the Weekly Times introduced local published and yet to be published writers on Sunday morning. This included Sue Goding, daughter of author of This bold venture. The story of Lak Tyers House, Place and People (2009) Alison Goding (dec) proved a point of interest to many as did the Lake Bunga Haven story edited by Krystyna Thomas. Both old boarding houses were purchased by collectives of families and friends in the 1960’s. All have been active in limiting inappropriate development on the lake. Megan Webb Hand spoke of writing her journey of recovery to health following abuse and addiction. A brave step with an unknown audience. Megan was well received by sympathetic listeners. For me, it was timely to mention my writing on the impact of Helenė Brophy who set up Rural Women’s Study groups across Gippsland in 1985/86. This was such a dynamic process that I began to find out how to implement this approach to enable local knowledge to become part of public decision making at a time when thinking was becoming increasingly urban and centralised. The final presentation was by Bruce Pascoe taking us through the content and background to his award winning book Dark Emu: black seed aboriginal agriculture or accident? (2015). It is both a challenging and affirming look at past life in this country: governance, culture, agriculture, fishing and lifestyle. It is an invitation to rethink our current and future place in the world. Like Wayne, Bruce has crafted stories that have universal relevance and current application if we find reciprocal ways of establishing ventures. The interest in growing and harvesting ancient plants in new ways could be a future project. 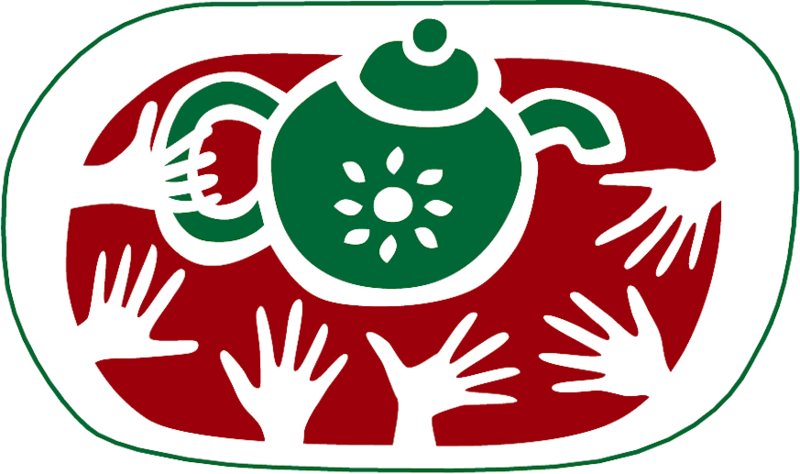 This busy weekend of connections and exceeded expectations could not have happened without the generosity of local cooks, cleaners and caterers, with sound people who stepped up to assist. Neil fired up the pizza oven at our park and this offered an opportunity to share food and conversation. Local businesses welcomed bookings for food and accommodation. Our partnership with Just Books a constant supporter of local writers continued, as did that with the East Gippsland Network of Neighbourhood Houses and the Nowa Nowa Caravan Park. The FLOAT artists and almancers gave moral support and much needed publicity, as did the ABC radio. The East Gippsland Shire Community Grants helped us cover presenters expenses and organising overheads. Local artist John McKenzie produced our logo and flyers. These collaborations are essential and we welcome new alliances for future events. I would love to hear of what the weekend meant for you, and ideas for future events. 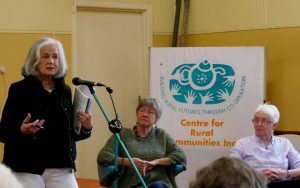 Centre for Rural Communities (www.ruralcommunities.com.au) and keep the 3rd weekend in October, 2018 free for the now annual event.